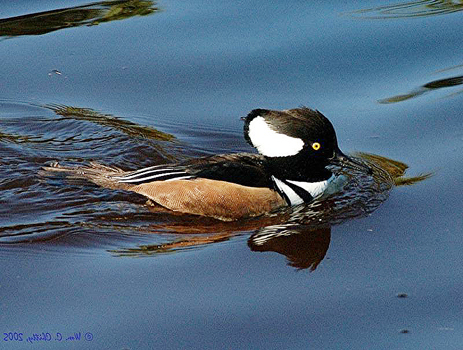 Hooded mergansers are winter residents in Florida, often seen on ponds, lakes and sometimes on coastal creeks. These small diving ducks have a narrow, finely serrated bill, and a crest on their head. Males have a black head with a conspicuous white patch on the crest, which is highly visible when raised. They feed on small fish, frogs, mollusks and aquatic insects, which they catch by diving underwater. The serrated bill is an adaptation for holding slippery prey. Courtship begins while the birds are in Florida, with displays that include head bobbing and pumping by the females while males flash their crests.